The ground was swallowing my options for release, and if it rains they might just disappear. Good Old War is an acoustic folk rock trio from Philadelphia, Pennsylvania. Before coming together as Good Old War, Keith Goodwin (vocals, guitar, keys) and Tim Arnold (vocals, drums, keys, accordion) were members of the progressive rock group Days Away. 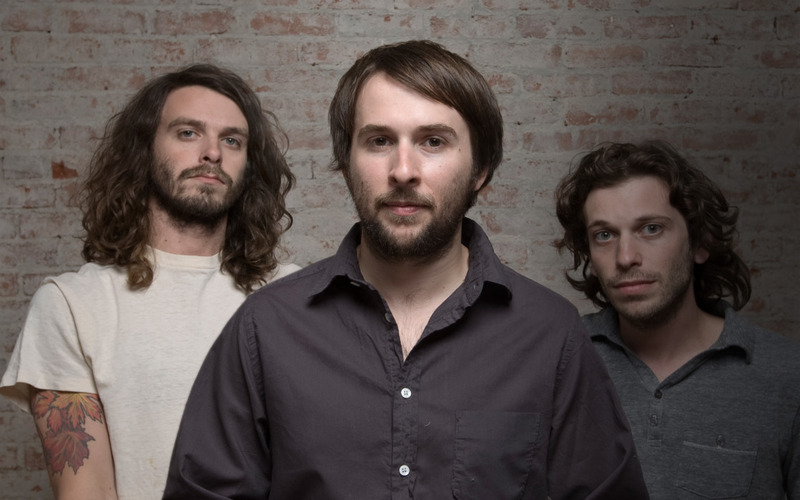 When Days Away went on hiatus in 2008, Goodwin and Arnold teamed up with Dan Schwartz (guitar, vocals), a former member of Unlikely Cowboy, to form Good Old War. The band's name comes from parts of each member's last name: Goodwin for Good, Arnold for Old, and Schwartz for War. Their debut album, Only Way To Be Alone, was released on Sargent House in 2008. This was followed by their self-titled sophomore album in 2010 and, most recently, 2012's album Come Back As Rain. Alongside recording their own music, Good Old War records with Anthony Green (of Circa Survive) and performs as his touring band. Good Old War's music is like that cheery old neighbor who always offers a smile and “hello!” to brighten up your day. Since 2008, the Philly-based trio have been making warm and inviting acoustic folk songs, built around gorgeous three-part harmonies. Their name comes from combining parts of their last names—Good from Keith Goodwin (vocals, guitar, keys), Old from Tim Arnold (vocals, drums, keys), and War from Dan Schwartz (vocals, guitar). Their latest album, Come Back As Rain, has a music video for “Calling Me Names” that seems to capture the entire band's aesthetic—driving in a vintage car with your closest buddies, rolling all the windows down and enjoying the warm breeze. Even when the car breaks down, and the guys are forced to push it up a hill into the setting sun, the song provides an optimistic soundtrack. Read on to find out more about their latest album, and what their name might be if they used their mother's maiden names instead. Band of the Day: Question: You guys just released your latest album, Come Back As Rain. Could you tell us how you came up with that album title? Keith Goodwin: Well I had that song about my aunt who passed away, and it had that lyric in there. So we just kinda picked it and went with it, you know? But it's not released, we never actually finished that song. Band of the Day: Any plans on releasing it? Tim Arnold: Yeah, we will, we just gotta make it perfect. You know, these things take time [laughs]! Band of the Day: On your self-titled album, you each have a song named after you [“GOOD”, “OLD”, and “WAR”]. Did you do anything similar with this album? Keith: No, we didn't do that this time around. This album was more of a collaborative effort. Not that the other ones weren't, but this one we just spent a lot more time together with the lyrics and all the different parts just making sure everyone was happy with everything, and really taking our time together. The first couple records, we'd each have a finished song and just kind of do our thing and lay down the track. This time we rehearsed it, sat with it for a bit, recorded it, listened back, just kind of fixed things together. Band of the Day: Do the meanings of your songs change for you as the years go on? Dan Schwartz: I think so. There are songs that meant something else at the beginning, and now mean something more about the band. “We've Come A Long Way,” for instance, is a song that Keith wrote about his family and his life. And now for me, when we play it live, it means something about the band. Band of the Day: What inspires you the most about today's music scene, and what discourages you the most? Keith: I think today's music scene is pretty cool, because you can do a lot yourself. There's a lot of technology where you can record yourself pretty easily, get it up on the internet, and I think that's cool and interesting. You don't have to necessarily rely on a lot of people, or spend a lot of money to make a great record. But the last record we put out, we did it all ourselves just to see if we could do it, as an experiment. I dunno, I wouldn't necessarily want to do it again because we're not professional engineers or scientists, but it's still cool that it's been played on television shows and commercials; that's something that we did ourselves. We didn't spend any money on it really. We did it in the basement and in different houses and stuff between tours. I think it's interesting and very cool that you CAN do that and be successful. Band of the Day: Is there a flip-side to that? Tim: There's not a ton of cash, so you kind of have to hunker down and do it yourselves. I dunno, you don't get to fly in private jets and stuff like you did back in the day [laughs]! Dan: It's kind of a double-edged sword, though. People don't necessarily need recordings as much as they used to because you can make things perfectly, using these programs to put everything in line and fix things. So now I feel like it's kind of a live show world. People see if you sound good and if you're a tight band live. The live show, I think, is so much more important now than it used to be, to prove that you're a really tight band. Band of the Day: OK, switching gears completely, what song do you wish was playing into the delivery room as you were coming into this world? Tim: [laughs] Can we think about that...? Keith: I got it, I got it [pulls out his iPhone]! Just one second...[all laugh as he starts playing “O Fortuna” from Carl Orff's 'Carmina Burana']. Dan: I think that goes for all of us [laughs]! Band of the Day: What's your favorite song lyric of all time? Tim: Picking favorites is always a hard one! Dan: Hmm...I think I'd probably have to pick something by Paul Simon, probably. I just like the way he talks. Band of the Day: Or you can also say the last lyric that was stuck in your head. Tim: The last one that was stuck in my head was [starts singing] “Tryin' to catch me ridin' dirty, tryin' to catch me ridin' dirty!” [from “Ridin Dirty” by Chamillionaire]. So there's that...great lyric [laughs]! Keith: That also goes for all of us! Dan: We all like dirty [laughs]! Band of the Day: Ok, so switching gears here: just like you can pair a good wine with cheese, what food would you pair with Good Old War's music? Dan: I dunno, I think we're more of a dessert kind of band. I would think we're like a strawberry cheesecake or something. Keith: Or maybe like some bacon-flavored ice cream with some french toast [all “oooh!” in response]. Dan: With a big cup of coffee! Band of the Day: Bacon-flavored ice cream? That sounds amazing! Tim: Most of our songs would be hard boiled eggs. Keith: [laughs] That doesn't sound good! Band of the Day: I dunno, maybe with some toast on the side it could be good...OK, if you guys had your mom's maiden names, instead of your own, what would your band name be? Dan: Oh, man [laughs]! Mine's Freed. Dan: Footloose and Lansheefree [laughs]! Band of the Day: What is the best Good Old War song to listen to when you're happy? Dan: I feel like “Calling Me Names” is a good happy song. Tim: Yeah, it's a good happy tune. Keith: I feel like “Just Another Day” is another good happy song. Band of the Day: What about when you're sad? Tim: “My Name's Sorrow” could be a sad song. Band of the Day: When you're feeling mellow? Keith: “Find Your Way Down,” maybe? Band of the Day: And when you're energetic? Keith: It's not called that [laughs]! Band of the Day: And finally, hungry, since we just paired your music with food? Band of the Day: Any parting words for Band of the Day users? Keith: You're awesome for being on Band of the Day, this app is great!